This is the last of my eight rows for my 2014 Texas Row by Row Quilt. Fabrics Etcetera is located in Webster, Texas. Their row of bird houses was fun to make and I loved their choice of fabrics. I really enjoy putting together a block that represents things like a house, or a boat, or even a jar of bugs. It is fun to see the picture evolve as you are sewing. Lone Star Quiltworks is located in Bryan, Texas, home of the Texas A&M Aggies. I was not able to get to the shop last summer, so I had to wait until the 2014 Texas Row by Row event was over. They mailed me the pattern and I used fabric from my stash to create the row. Lots of fusing on this row and I zigzagged around the fused pieced. The pieced bluebonnets turned out nice! I was a little nervous. Great directions helped! Quilter’s Emporium is located in Stafford. Lovely quilt shop! This row’s name is “Regatta!” The row was as challenging as it looks, but I was pleased with the results! BJ’s Quilt Shop is located in Bay City. They apparently do not have a website so a link is not provided. My friend, Sally, who also participated in the 2014 Texas Row by Row, picked up the pattern and fabric pack for me. The row is called “Harvest Time.” This was the only row I sewed where all the fabric pieces were actually cut to size by the shop. Talk about spoiling your customers! I think it sewed up in twenty minutes. Not so with any other of the seven rows. My favorite jar is the colorful bug jar. Now I gotta turn the rows into a quilt top. Planning on hanging it in my quilt room. Johnny “Football” Manziel … and the spontaneous night at the Heisman Awards! So by now everyone that doesn’t live under a ginormous boulder in the middle of the Grand Canyon knows Texas A&M’s very own Johnny “Football” Manziel won the Heisman! My daughter, Katie, and new husband, Chad, just happened to be in New York City hanging with Chad’s brother and family the very weekend of the Heisman award. They got there the Thursday before the big Heisman announcement. The city was buzzing about the upcoming event that would be held Saturday. I saw their pictures on Facebook. It sure looked like they were having a great time. There were pictures of Magnolia Bakery cupcakes, Rockefeller Center, Central Park, and the Christmas Market at Columbus Circle. And every day they made sure to walk past the Best Buy Theater on Broadway … just in case there was a Johnny “Football” Manziel sighting. Did I mention Chad graduated from Texas A&M? This season Chad and some of his buddies attended the game of a lifetime … the A&M/Alabama game where A&M stomped all over Bama. Oh, and anyone that knows our daughter also knows Katie went to The University of Texas. I know … it’s a mixed marriage … but if anyone can make it work … they can. So the night the Heisman was announced Katie, Chad and his brother, Kevin, decided, what the heck, let’s head down to Best Buy Theater for the big announcement. They were staying in Harlem and unfortunately missed the train that would bring them to Best Buy Theater on time. The important thing was to be down at the theater to celebrate. After all … Manzeil had won!!! “My heart was racing when Katie handed me the VIP pass and told me to GO!! I had no idea I was heading to the floor where all the action was. 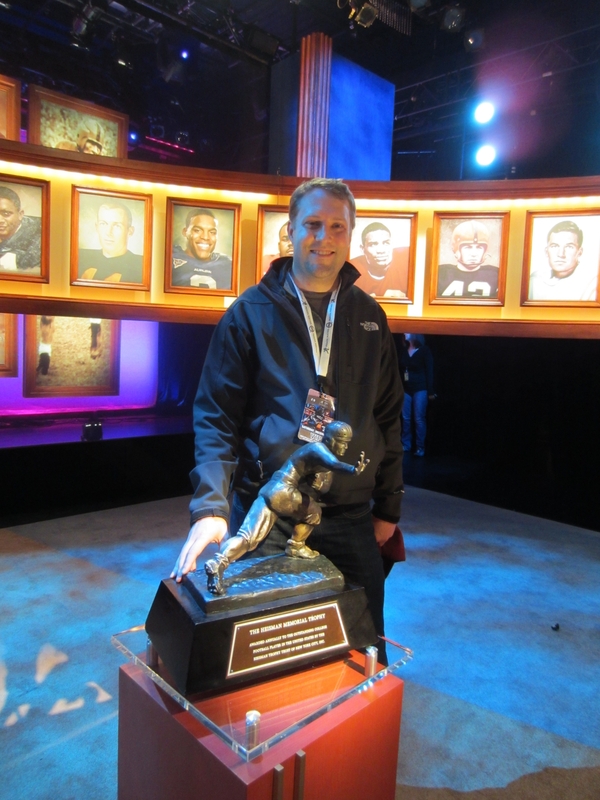 I was just a few feet away from the greatest Heisman winners to play football … Doug Flutie, Earl Campbell, John David Crow to name a few,” said Chad. “It wasn’t until later that I actually shook hands with Johnny Manziel. Katie, Kevin and I were walking the hallways on the 43rd floor of the Marriott marquis, where the Heisman hospitality suite was. Johnny and a few others walked right by so I was able to say congrats and quickly shake his hand,” Chad said. Chad and Katie call it their spontaneous night at the Heisman Awards Ceremony. What a night … on so many levels!